Roanoke Island, North Carolina by Carol Highsmith. The Roanoke Colony, also known as the Lost Colony, was the first attempt at founding a permanent English settlement in North America. 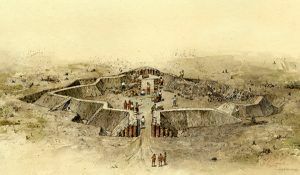 It was located in Dare County, North Carolina and today is part of the Fort Raleigh National Historic Site, which commemorates the first English attempts at establishing a settlement in North America. 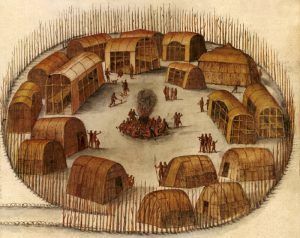 The early English colonization of Roanoke Island was a significant event in the gradual process of English settlement in the New World — a process that began with the English explorations of the western hemisphere in the late 15th and early 16th centuries. The first English efforts to explore the new continent trace back to King Henry VII who encouraged English merchants to explore and enter into foreign trade. He provided financial backing for John Cabot, the Italian who first visited the New World in 1496. On Cabot’s second voyage in 1497, he planted the first English flag on the North American mainland in what is now Canada. The King’s granddaughter, Queen Elizabeth I, who came to the throne in 1558, also wanted to explore and exploit the New World, as well as decreasing the Spanish dominance that had already been established there. However, during her reign, England did not have the resources to establish a foothold in the New World, so all English enterprises in the Atlantic were to be financed by private investors who received authorization from the English government to work as privateers. England needed the wealth of the New World to enlarge its boundaries and increase its power and realized that attacking Spanish treasure ships was an ideal way to fight their enemy. By the 1580s, English privateers were regularly attacking Spanish vessels in an effort to control their expanding empire and in 1584 a major sea war between England and Spain developed and England then sent Sir Francis Drake to raid and plunder Spanish possessions in the West Indies. 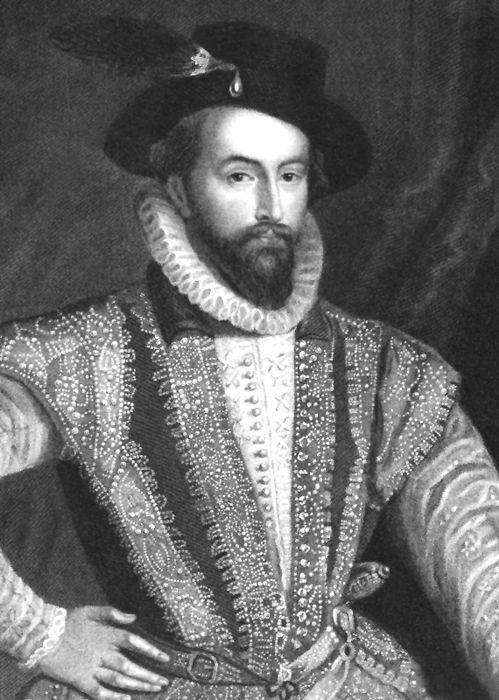 Many of the early privateers in this open sea war with Spain were gentlemen such as Sir Walter Raleigh, who saw the venture as a patriotic act as well as a way to amass large fortunes and relieve themselves of financial difficulties. With financial backing from a number of influential shareholders, Sir Humphrey Gilbert, Walter Raleigh, and seven ships sailed from Plymouth, England in November 1578 to establish a colony in Newfoundland. The underlying mission of the expedition was to prey upon Spanish shipping. Storms, however, forced Gilbert to abort the mission and return to England. In 1583, Gilbert headed another expedition, which ended in disaster when Gilbert was lost at sea. Walter Raleigh, however, did not join the second venture. By this time he had become a favorite of Queen Elizabeth, who forbade him to sail on such a dangerous voyage. As the Queen’s favorite, Raleigh received vast estates in Ireland and large holdings in England, as well as the patent on wines and the license to export woolen cloths. Other benefits included the assignment of various government offices. In 1584, a year after Gilbert’s death, Queen Elizabeth knighted Raleigh and granted him Gilbert’s patent to establish colonies in America. Raleigh, like Gilbert, aimed to establish a settlement which would serve as a base for English privateering ventures against Spanish ships. However, Raleigh directed his efforts farther to the south, purposely venturing into Spanish interests to find a semi-secluded location close to Spanish shipping routes from the West Indies. On April 27, 1584, Raleigh’s first expedition left England for the North American coast, but Raleigh did not accompany the fleet. Captains Philip Amadas and Arthur Barlowe commanded the two ships and landed on the present-day North Carolina coast approximately 24 miles north of Roanoke Island on July 13, 1584. The expedition made an important contact with local Algonquian Indians living there, including a well-placed member of a ruling family, Granganimeo. After spending several months in the area, the expedition left for England in September 1584. Along with them were two Algonquian men — Manteo of the Croatoan tribe and Wanchese of the Roanoke tribe. 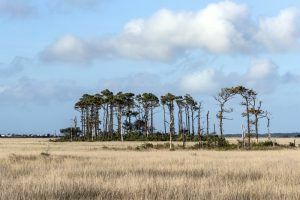 The captains, with the help of the two Indians, reported favorably on the Outer Banks area, suggesting that it would be an ideal site for a settlement. 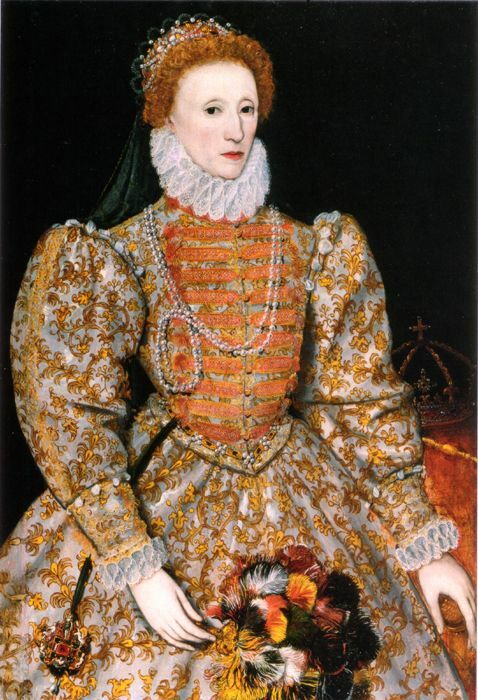 With Queen Elizabeth’s permission, Sir Walter Raleigh then christened the new land “Virginia” after her, the Virgin Queen. In 1585, Raleigh appointed Sir Richard Grenville, his cousin, to establish a settlement in North America. Grenville, another well-known privateer, sailed from England in 1585 with seven vessels and approximately 600 men, nearly half of whom were professional soldiers or specialists. 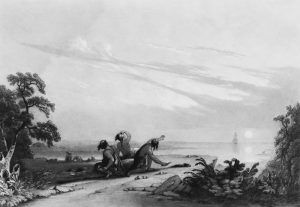 Captain Amadas and Navigator, Simon Fernandes, who were with the first expedition, were also the group, as well as Ralph Lane, a fortifications expert; John White, an artist to record the landscape and flora and fauna, Thomas Hariot, a scientist to collect samples; and Joachim Gans, a metallurgist to assess the commercial potential of the land. The two Native Americans, Manteo and Wanchese, also returned to America on this voyage. The expedition first arrived in Puerto Rico on May 12 where they made repairs, captured two Spanish frigates, and seized a supply of salt from the Spanish. Grenville’s expedition landed on the Outer Banks of North Carolina on June 26. After a brief exploration of the Outer Banks and Roanoke Island, and making contact with the local Indians, Grenville departed for England on August 17, 1585, promising to return in April 1586 with more men and fresh supplies. He left Ralph Lane in charge of a colony of 107 men on Roanoke Island. Since the site was too shallow for a privateering base, Ralph Lane was to use Roanoke as a base to search for a more suitable harbor site. 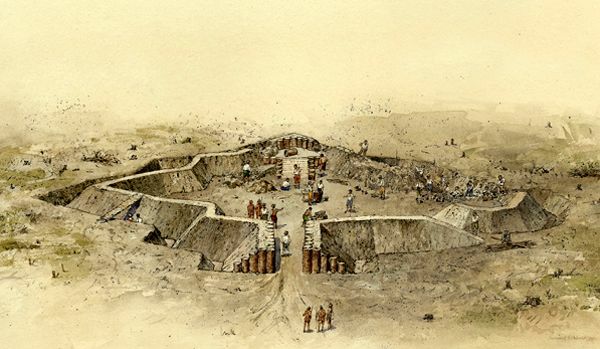 Lane then designed and supervised the construction of a fort at the north end of Roanoke Island. It was completed by September. His men also erected a “science center” on the north end of the island to assess the area’s resources and commercial potential. Other improvements included a separate village on the north end of Roanoke Island containing one-and-a-half- and two-story residences with thatched roofs and several other structures. Although some of the soldiers were stationed at the fort, Ralph Lane and several of the gentlemen on the expedition resided in the village. The following year, Lane and several members of the colony explored the mainland and surrounding area as far north as the Chesapeake Bay. In the course of these explorations, Lane and his men succeeded in alienating a large portion of the Native American population, resulting in hostile relations between the two. As April 1586 passed, there was no sign of Grenville’s relief fleet. With the delay in the arrival of supplies, the colonists grew impatient as provisions ran out and relations with the indigenous population continued to deteriorate. The local Indians attacked the fort but the colonists were able to repel it. In June, Sir Francis Drake stopped at the colony on a return trip after a successful raid in the West Indies. Drake offered to take the colonists back to England and they accepted, missing one of Grenville’s supply ships by only a short time. Grenville himself arrived with several ships and relief stores in August and was disappointed to see the colony abandoned. He did not want to lose possession of the settled area and left a small detachment of 15 men with four cannons and supplies for two years to maintain an English presence and to protect Raleigh’s claim to Roanoke Island. When the colonists returned to England they introduced tobacco, maize, and potatoes.